What is mitral valve prolapse? What causes it, and what does it look like (pictures)? What are the sign and symptoms of mitral valve prolapse? What are the risk factors for mitral valve prolapse? What is the prognosis and life expectancy for mitral valve prolapse? Mitral valve prolapse (mitral valve prolapse) is the most common heart valve abnormality. Most people with mitral valve prolapse have no symptoms and require no treatment. Mitral valve risk factors include age, family history, and certain diseases. Mitral valve prolapse can often be detected by a doctor during examination of the heart. Diagnosis of mitral valve prolapse can be confirmed with an echocardiogram. People with mitral valve prolapse may need antibiotics prior to any procedure that might introduce bacteria into the bloodstream, including dental work and minor surgery. Mitral valve prolapse (also known as "click murmur syndrome" and "Barlow's syndrome") is the most common heart valve abnormality. The condition is slightly more prevalent in women than in men. The mitral valve is one of the four heart valves. A normal mitral valve consists of two thin leaflets, located between the left atrium and the left ventricle of the heart. Mitral valve leaflets, shaped like parachutes, are attached to the inner wall of the left ventricle by a series of strings called "chordae." When the ventricles contract, the mitral valve leaflets close snugly and prevent the backflow of blood from the left ventricle into the left atrium. When the ventricles relax, the valves open to allow oxygenated blood from the lungs to fill the left ventricle. In mitral valve prolapse, the mitral apparatus (valve leaflets and chordae) becomes affected by a process called myxomatous degeneration. In myxomatous degeneration, the structural protein collagen forms abnormally and causes thickening, enlargement, and redundancy of the leaflets and chordae. Blood normally flows through the mitral valve from the left upper chamber (left atrium) to the left lower chamber (left ventricle) of the heart. When the ventricles contract, the redundant leaflets prolapse (flop backwards) into the left atrium, sometimes allowing leakage of blood through the valve opening (mitral regurgitation) back into the left atrium. When severe, mitral regurgitation can lead to heart failure and abnormal heart rhythms. Most people are unaware of the prolapsing of the mitral valve. However, others may experience a number of symptoms. The mitral valve prolapse (MVP) syndrome has a strong hereditary tendency, although the exact cause is unknown. Affected family members are often tall, thin, with long arms and fingers, and straight backs. Mitral valve prolapse is more common in women from 20 to 40 years old; however, also occurs in men. For reasons not clear, people with mild mitral valve prolapse often have more symptoms and signs than those with severe prolapse (which may require surgery). Rarely, people with severe mitral valve prolapse will have symptoms that can affect the entire body. People who have anxiety and panic attacks seem to be at a higher risk of having mitral valve prolapse. Anxiety, panic attacks, and mitral valve prolapse have similar symptoms like palpitations and chest pain. Symptoms of mitral valve prolapse that do not occur with anxiety or panic attacks include fatigue, migraines, and pulmonary edema. If you have mitral valve prolapse, talk to your doctor before you have any dental procedures. Fatigue is the most common symptom of mitral valve prolapse, although the reason for fatigue is not understood. People with mitral valve prolapse may have imbalances in their autonomic nervous system, which regulates heart rate and breathing. These imbalances may cause inadequate blood oxygen delivery to the working muscles during exercise, thereby causing fatigue. Palpitations are sensations of fast or irregular heart beats. In most people with mitral valve prolapse, palpitations are harmless. Rarely, potentially serious heart rhythm abnormalities may underlie palpitations and require further evaluation and treatment. Sharp chest pains, which can be prolonged. Unlike angina and chest pain, rarely, mitral valve prolapse occurs during or after exercise,and may not respond to nitroglycerin. Anxiety, panic attacks, and depression may be associated with mitral valve prolapse. Like fatigue, these symptoms are believed to be related to imbalances of the autonomic nervous system. Migraine headaches have been occasionally linked to mitral valve prolapse. The migraines are probably related to abnormal nervous system control of the tension in the blood vessels in the brain. Pulmonary edema usually occurs when fluid inside of the blood vessels of the lungs leak outside of vessel, which causes swelling of the surrounding tissues. Often the severity of symptoms in people with mitral prolapse is inversely correlated to the degree of anatomic abnormality of the heart. Many people with severe symptoms have barely detectable prolapse, and the small minority with severe prolapse and valve dysfunction have no symptoms. Examination of the patient reveals characteristic findings unique to mitral valve prolapse. Using a stethoscope, a clicking sound is heard soon after the ventricle begins to contract. This clicking is felt to reflect tightening of the abnormal valve leaflets against the pressure load of the left ventricle. If there is associated leakage (regurgitation) of blood through the abnormal valve opening, a "whooshing" sound (murmur) can be heard immediately following the clicking sound. Echocardiography (ultrasound imaging of the heart) is the most useful test for mitral valve prolapse. Echocardiography can measure the severity of prolapse and the degree of mitral regurgitation. It can also detect areas of infection on the abnormal valves. Valve infection is called endocarditis and is a very rare, but potentially serious complication of mitral valve prolapse. Echocardiography can also evaluate the effect of prolapse and regurgitation on the functioning of the muscles of the ventricles. Abnormally rapid or irregular heart rhythms can occur in patients with mitral valve prolapse, causing palpitations. A 24-hour Holter monitor is a device that takes a continuous recording of the patient's heart rhythm as the patient carries on his/her daily activities. Abnormal rhythms occurring during the test period are captured and analyzed at a later date. If abnormal rhythms do not occur every day, the Holter recording may fail to capture the abnormal rhythms. These patients then can be fitted with a small "event-recorder" to be worn for up to several weeks. When the patient senses a palpitation, an event button can be pressed to record the heart rhythm prior to, during, and after the palpitations. Abnormally rapid or irregular heart rhythms can occur in patients with mitral valve prolapse, causing palpitations. A 24-hour Holter monitor is a device that takes a continuous recording of the patient's heart rhythm as the patient carries on his/her daily activities. Abnormal rhythms that occur during the test period are captured on the device and then are analyzed later. If abnormal rhythms do not occur every day, the Holter recording may fail to capture the abnormal rhythms. These patients then can be fitted with a small "event-recorder" that can be worn for several weeks. When the patient senses a palpitation, an event button can be pressed to record the heart rhythm prior to, during, and after the palpitations. The American Heart Association describes two types of recorders, looping memory monitors and symptom event monitors. Looping monitors are activated by pushing a button, and can be programed to record your EKG a few minutes before and after you push the button. Event monitors can be put on your wrist or chest and will record your EKG, but will not record those few minutes before you activate it, like the looping memory monitor does. However, both can transmit your recorded EKG to a hospital or doctor‘s office. The majority of people with mitral valve prolapse have an excellent prognosis and need no treatment. For these individuals, routine examinations including echocardiograms every few years may suffice. Mitral regurgitation in patients with mitral valve prolapse can lead to heart failure, heart enlargement, and abnormal rhythms. Therefore, those patients with mitral valve prolapse and regurgitation often are evaluated annually. A rare, but potentially serious complication of mitral valve prolapse is endocarditis (valve infection or valve leakage,); therefore, individuals with mitral valve prolapse usually are prescribed antibiotics prior to any procedure that can introduce bacteria into the bloodstream. Examples of procedures include routine dental work, minor surgery, and procedures that can traumatize body tissues such as colonoscopy or gynecologic or urologic examinations. Examples of antibiotics used include oral amoxicillin and erythromycin as well as intramuscular or intravenous ampicillin, gentamycin, and vancomycin. People with severe prolapse, abnormal heart rhythms, fainting spells, significant palpitations, chest pain, and anxiety attacks may need medication. Beta-blockers, such as atenolol (Tenormin), metoprolol (Lopressor), and propranolol (Inderal), are the drugs of choice. These act by increasing the size of the left ventricle, thereby reducing the degree of prolapse. The calcium blockers verapamil (Calan) and diltiazem (Cardizem) are useful in people who cannot tolerate beta-blockers. Although most patients with mitral valve prolapse require no treatment or treatment with oral medications, the prognosis is usually good. Rarely, surgery for mitral valve replacement or repair may be require. People who require surgery usually have severe mitral regurgitation causing worsening heart failure and progressive heart enlargement. Rarely, rupture of one or more chordae can cause sudden, severe mitral regurgitation and heart failure requiring surgical repair. Mitral valve repair is preferable, if possible, to mitral valve replacement as the surgical treatment for mitral valve regurgitation. After mitral valve replacement, lifelong blood thinning medications are necessary to prevent blood from clotting on the artificial valves. After mitral valve repair, these blood-thinning medications are unnecessary. 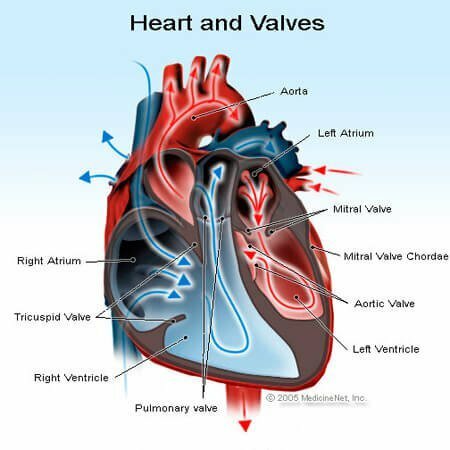 Due to the success of valve repair, it is being performed earlier in people with mitral regurgitation, thus reducing the risk of abnormal heart rhythms, heart failure, and death. Palpitations are sensations of fast or irregular heartbeats. In most patients with mitral valve prolapse, palpitations are harmless. In very rare cases, potentially serious heart rhythm abnormalities (for example, atrial fibrillation) may underlie palpitations and require further evaluation and treatment. 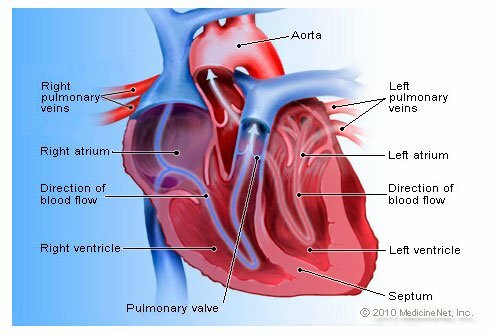 Moreover, pulmonary hypertension may develop and lead to heart failure. Sharp chest pains are reported in some patients with mitral valve prolapse, which can be prolonged. Unlike angina, chest pain with mitral valve prolapse rarely occurs during or after exercise, and may not respond to nitroglycerin. Migraine headaches have been occasionally linked to mitral valve prolapse. They are probably related to abnormal nervous system control of the tension in the blood vessels in the brain. Mitral valve prolapse may be rarely associated with strokes occurring in young people. These patients appear to have increased blood clotting tendencies due to abnormally sticky blood clotting elements, called platelets. Often the severity of symptoms in patients with mitral prolapse is inversely correlated to the degree of anatomic abnormality. Many patients with severe symptoms have barely detectable prolapse, and the small minority with severe prolapse and valve dysfunction have no symptoms. Although some people with mitral valve prolapse may experience a variety of complications, most have no symptoms and can lead healthy, active, and normal lives. More importantly, the overwhelming majority of people with mitral valve prolapse have bothersome symptoms, but not life-threatening problems. Rarely, a person may need surgery or other aggressive therapies. Moreover, the symptoms may be very episodic, and come in waves and then disappear for some time. Symptoms of mitral valve prolapse may be aggravated by pregnancy, stress, pregnancy, fatigue, menstrual cycles (menstruation), or other illnesses. Life expectancy for people with mitral valve prolapse usually is normal, which includes young people that require surgery. People that develop complications from the condition or have other medical problems may have a reduced life expectancy related to the complication. Bonow, Robert O., et al. Braunwald's Heart Disease: A Textbook of Cardiovascular Medicine. 9th ed. Elsevier Saunders, 2011. Qurat-ul-ain Jelani, MD. Mitral Valve Prolapse. Medscape. Updated: Nov 16, 2016. Heart valves that are diseased can be treated both surgically (traditional heart valve surgery) and non-surgically (balloon valvuoplasty). The mitral valve is the most commonly repaired heart valve, but the aortic, pulmonic, and tricuspid valves may also undergo some of these repair techniques.